Submitted by mahoney on Mon, 03/03/2008 - 11:14am. 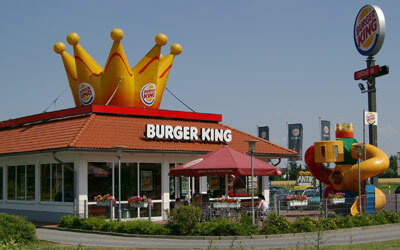 Burger King Restaurants across the USA including Hawaii and Alaska...Burger King, often abbreviated to BK, is a global chain of hamburger fast food restaurants. It was founded in 1954 by James McLamore and David Edgerton, and has since used a franchise model to expand to just under 11,300 stores in 69 nations around the globe. This file has been renamed to BurgerKing USA/Canada. The Canadian locations were added to the file. All of these new locations were taken from the official BK website and GPS visualizer was used to obtain the coordinates. Actively comparing the locations in the file to the official BK website locator. See below for the states that have been completed. The comparison of the file to the BK website locator is complete. All of the locations contained in the file were verified or added as a result of the website locator. Locations not found on the website locator were removed from the file. If any locations were missed, please send them to me. Completed the update of the Canadian locations. Updated the entire ON canada locations. Submitted the correct locations in Hamilton,ON. Submitted a closed location in Columbia,SC and also included some missing phone numbers. Updated GA. Net increase of 28 locations. Added 10 new locations in FL. Submitted a closed location. 765 N Lake Ave, Pasadena,CA. Updated NJ, NM, NS, NV and NY. Updated MN and MO. Decrease of 7 locations. Updated MA,MB and MD. Net decrease of 26 locations. Updated KS, KY and LA. Net decrease of 13 locations. Also corrected 27 addresses. Updated HI,IA,ID,IL and IN. (Added 33 locations, deleted 73 locations and corrected 17 addresses. Updated GA. Net decrease of 20 locatons. Updated FL locations. Net decrease of 30 locations. Completed the update of CO,CT,DC and DE. Updated CA. Added 32, deleted 128, corrected 16 addresses and 4 cities. Updated BC.Added 6, deleted 11 and corrected 3 addresses. Updated Az. Added 11 locations, deleted 13 locations and corrected 3 addresses. Updated AB, AK, AL and AR. Deleted the location in Glenwood Springs,CO. It is now a Culver's. Corrected the coord for the location in Hope Hull,Al. Noted that the location at 1701 Artesia Blvd, Gardena,Ca had closed and replaced with an In n Out Burger. Updated all locations in Charlotte,NC. Submitted a closed location. 159 Collins Rd NE, Cedar Rapids,IA. Updated the file. Decrease of 16 locations. Updated the file. Net increase of 35 locations. Submitted a new location in Enfield,NS. Submitted corrected coordinates for the location in Elizabethtown,PA. Added 10 new locations to the file. Submitted a new location at 9090 Merrell Rd, Jacksonville,FL. Submitted a closed location at 25 Highland Rd, Bethel Park,PA. Added new locations in Mt Dora,FL and Naples,FL. Added new locations in St Augustine,FL and Harrisonburg,VA. Submitted corrected coordinates for the location in Brevard,NC. Updated the locations in Turnpike Service Plazas in the following states:De,In,Ma,Md,Me,Nj,Ny,Oh,Ok,Pa and WV. Location at 380 E Merritt Island Causeway, Merritt Island,FL has reopened. Added new locations: Abilene,TX, Arlington,TX, Austin,TX (2), Buda,TX and Irvine,TX. Submitted a new location at 13542 W Hwy 290, Austin,TX. The Location at 380 E Merritt Island Cswy, Merritt Island,FL is Closed for renovation. Corrected the coordinates for the locations in St Cloud,Mn and Rapid City,SD. Corrected the coordinates for the location in Calumet,MI. Submitted a closed location in Mesquite,NV. Submitted corrected coordinates for the location at 1935 E Joppa Rd, Baltimore,MD. Added new locations in Colorado Springs,Co. Corrected the coordinates for both locations in Staunton,VA. Removed one duplicate in Vancouver,BC. Submitted a closed location 1493 Marine Dr, North Vancouver,BC,that had been relocated to 801 Marine Dr already in the file..
Added locations in Ponderay,ID,Post Falls,ID,Blaine,WA,Maple Valley,WA,Omak,WA and Prosser,WA. Corrected the coordinates for the locations in Alma,AR and Malvern,AR. Submitted a new location in Westbank,BC and the location at 580 Harvey, Kelowna,BC has closed. Noted that the coordinates for the location in Lawn,PA were incorrect. Correct coordinates have been made. The location at 8209 Knoxville, Peoria,Il has closed. Removed another location in Smiths Creek,Mi. Neither location existed. Made the input that the location at 2593 N Wadhams Rd, Smiths Creek,Mi,does not exist. Deleted 1 location in Waynesboro,Va and corrected the coordinates for the remaining location. Location at 4875 Virginia Beach Blvd, Virginia Beach,Va is closed. Added the following Michigan locations: Cheboygan,Indian River,Petoskey(2),Charlevoix,St Ignace,Mackinaw City,Gaylord(2),Alpena. Added all the Canadian locations to the file. Renamed the file to reflect these additions. Deleted additional duplicates found in the file. Removed the location at 614 S Sandusky St, Delaware,OH. Fixed coordinates on Kinder,LA location. Deleted 1941 Sunset Ave, Rocky Mount,NC due to closing. Deleted 3301 Lehigh St, Allentown,PA due to closing. Added 1 location in Ashtabula,Oh. Deleted 7114 N 138th Ave, Glendale,AZ location due to closing. Deleted 1 Charlotte,NC location due to closing. Removed 2 Wilson,NC locations due to closing. Removed 2 Duncan,SC location due to closing.